Review: Twilight Force – Heroes Of Mighty Magic – Nuclear Blast Records – Release: Out Now. 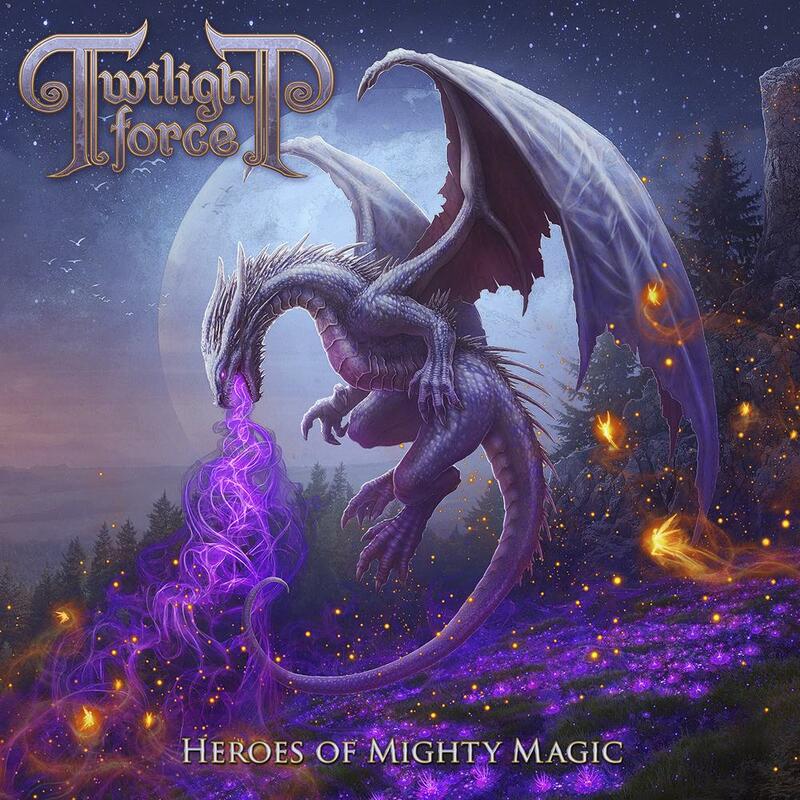 But the brave Swedes from Twilight Force now prove with their second album “Heroes Of Mighty Magic”, that epic metal doesn’t necessarily need tanks and can also be played with a bow and arrow. I was very fond of the debut album a few years ago and I did see the band live at work once! This triggered my curiosity to listen to this new album. Unfortunately personal matters kept me from doing it. But when I heard the opener ‘Battle Of Arcane Might’ a few weeks ago all my troubles disappeared. There immediately appeared a ‘Joker’ sized smile upon my face. This kind of music is an instant happy-maker! Big orchestrations, speedy riffs, powerful drums and superb vocals invade my ears. Another fact is the high sing along factor of the songs. This becomes crystal clear when you go to a gig from these warriors. The guitar solos are fast and melodic. It’s the combination of all above that transforms these songs into instant likes! It’s great to hear the old Rhapsody sound back again and this time around with the power vocals from Chrileon. Although he can hit the high notes as well! In ‘Guardian Of The Seas’ the guitars shred like Yngwie Malmsteen used to do! The lyrics are all fantasy tales around dragons and the band strengthen these tales by their ‘dress code’. They simply walked out of a fantasy movie. All band members have pseudonyms which also increases the mystery! The long adventurous ‘There And Back Again’ has an atmospheric and bombastic middle section and at the end they incorporated a short narration. The spirit of Helloween is also present during these über happy metal tracks! The massive choir in ‘Keepers Of Fate’ forces you to sing along and before you know it you’re part of the family of followers! ‘To The Stars’ is by far the fastest track and combines influences from Rhapsody and Hammerfall into a not to sneezed at cocktail! The title track is another epic song with great choirs and many twists and turns that take you on a musical trip that lasts for ten minutes. The album ends a bit odd though. ‘Epilogue’ is a long narration without any instruments! It fits the story but I think the skip button will do his job here! Last short track ‘Knights Of Twilight’s Might’ can be seen as an end score of a movie! When you’re a sucker for big orchestration you simply have to buy this album! Besides that, the artwork is simply stunning! The band has managed to make an even better album than that debut. This dragon tale is an awesome trip with tons of fun! The guitars sound absolutely great and the vocals from leader Chrileon are out of this world! I’m hoping to catch these lads again on stage in the nearby future.